Home > Mobile Care > How Do Mobile Costs Compare with Other Services? The mobile phone is widely seen as a cheaper alternative to the traditional landline telephone, but the reality is that for many consumers it is actually the pricier option. 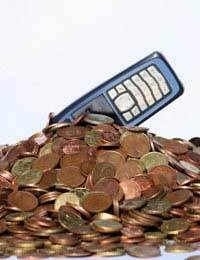 Although statistics show that the mobile phone is on average cheaper than its landline equivalent - according to Ofcom, the average monthly mobile phone bill is £17.59, almost £5 less than the average UK landline bill – it is not proving to be the most cost effective option for everyone. The confusing array of tariffs and offers, and general bad account management, has meant that many consumers are actually paying over the odds for their mobile. With so many networks, phones and tariffs available, it might seem like the mobile customer is in a rare position of power, able to pinpoint the deal that fits their lifestyle, taste and budget perfectly. For consumers able to identify what they want without being distracted by the dazzling offers or confused by the fiendishly complex price structures, then it is ideal. However, for many others it has just led to major money wastage. It is estimated that the British mobile phone industry rakes in over £8.45 billion a year from customers on the wrong mobile phone tariff. Mobile phones should be much cheaper than landline phones, providing consumers take greater care in choosing a tariff most appropriate to their intended mobile use and in regularly monitoring their monthly bill to see whether it is the right one. According to the consumer website moneysupermarket.com, 50% of mobile users don’t know how many texts or minutes they use every month, so it’s important to check. On average, mobile users use 23 minutes and 23 texts over their allowance, which means they are paying well over the odds for additional calls and texts. If the monthly bill shows that you are using up all your free call and text allowance then take it as a sign that you should consider moving to a tariff with a greater number of inclusive minutes and texts. Equally if you are only using a fraction of your allowance then you should rethink your tariff and opt for a cheaper deal, or even consider Pay-As-You-Go (PAYG) or a SIM-only deal. There are now a variety of websites available that can help find the best deal according to your usage, such as onecompare.com, moneysupermarket.com and uswitch.com. As a general guide, if you find that you are making less than 150 minutes of calls and sending fewer than 100 texts a month then a PAYG phone will work out to be a cheaper alternative to a monthly contract phone. The PAYG market is becoming increasingly popular and competitive as consumers try to cut down on their monthly expenditure. SIM-only deals are a more flexible and potentially cheaper alternative to standard contract phones. As you are not getting a subsidised mobile handset, you get more minutes and texts for your money. Also SIM-only contracts are typically a month at a time so you won’t be tied to restrictive 12 or 18 month contracts. Another largely unnecessary mobile expense that helps make many mobile bills costlier than landline charges is insurance. Specialist policies sold by mobile phone firms can cost anywhere between £1.99 and £9.99 each month and add up to over £100 a year. Many phone users are finding that insurance is not worth it because if their mobile is broken or stolen then they can usually replace it with the amount they would spend each year on their policy. What’s more, not only does the British Insurance Brokers’ Association (BIBA) agree that mobile insurance policies are expensive but they say they’re also difficult to claim on. One alternative telephone operation that mobile phones certainly can’t compete with on price is that provided by Voice Over Internet Technology (VoIP) services like Skype. This allows users to speak to one another across the web for free. All they need is a good internet connection and a headset. However, the quality is lower than the average mobile phone and being tied to a computer means it also doesn’t have the same level of mobility.